Rigid Mounting Solutions - RAM Style UNIVERSAL - Dezod Motorsports Inc - Home of the automotive performance enthusiast since 2002. To accommodate Rigid Industries’ SR-M Series, SR-Q Series and D-Series LED Lights, Rigid Offers 17 different custom RAM mounting systems. You may choose from three different surface attachment methods: Suction Cup, Flat Surface Bolt-Down or a Pole Clamp. You can choose from three different arm lengths: short, medium, or long. You can also choose a single light attachment point or a plate for mounting multiple lights. RAM Mount’s ball and joint design allows for a full 360° rotation. RAM Mounts are extremely durable (supports up to 5 lbs in a rugged environment), all stainless steel hardware, provide maximum adjustability and are backed by RAM Mounts’ lifetime warranty. This mount features a 2.5” diameter round base with 7 bolt holes. The base holds a 1” diameter ball which connects to a 6” long arm. At the end of the arm is another 1” diameter ball which connects to a 6”X2.25” mounting plate. 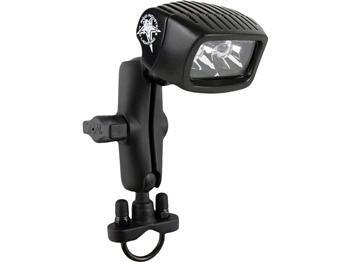 Great for permanently mounting multiple SR-M Series, SR-Q Series or D-Series lights on a flat surface with maximum adjustability.